The Website/URL field is used for entering a single website and/or URL and will only pass validation if the value entered is in a valid URL format. In addition to the standard field options, a Website/URL field has a 'Show URL image' option. Select 'Show URL image' if you would like the image of the URL shown on your entries listing page. 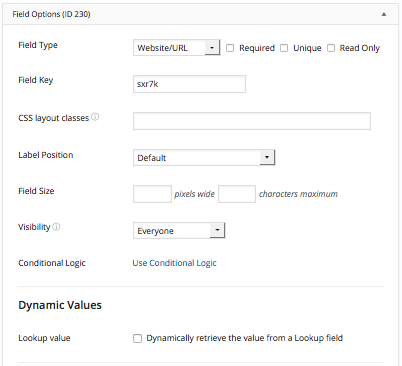 The default value icons can be used to specify whether the text entered in a Website/URL field on the form builder page should be a default value or a placeholder. Learn how to set a default value and how to set a placeholder in a text field. Display the value submitted in a Website/URL field in a form's confirmation message, email, or View. Display URL: Display the submitted URL. Replace x with the ID or key of the Website/URL field. Clickable link: Display the URL as a clickable link. Display the image: If the submitted URL is a link to an image, display that image. Display clickable image: Display a clickable image. Display a YouTube video: Display a YouTube video.